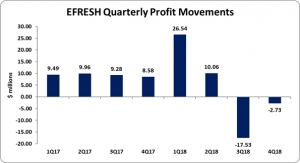 Everything Fresh Limited (EFRESH), audited results for the year ended December 31, 2018 reported that Revenue grew by 4% for the period amounting to $1.88 billion, up from $1.81 billion reported a year ago. For the fourth quarter, revenues totaled of $488.68 million, a 10% increase when compared to last period’s $443.15 million. Cost of sales closed the period at $1.66 billion (2017: $1.58 billion) which translated into a gross profit of $218.71 million (2017: $229.05 million). For the fourth quarter, gross profit grew by 187% to $99.69 million relative to $35.05 million in 2017. Other operating income declined by 12% for the period to $2.22 million from $2.52 million reported the prior year. Operating expenses totaled $188.64 million, 8% more than the $174.35 million booked the previous year. Of this, administrative expenses rose to $177.99 million (2017: $171.33 million), while selling and promotion expenses amounted to $10.65 million (2017:$3.03 million). In addition, finance costs amounted to $13.53 million in comparison to 2017’s $11.85 million. Profit before tax declined 59% for the period totaling $18.76 million in comparison to 2017’s $45.37 million. Following taxation of $2.42 million (2017: $8.07 million), net profit of $16.34 million was booked for the period relative to $37.30 million for the corresponding period in 2017. However, for the quarter a net loss of $2.73 million was booked compared to a net profit of $8.58 million in the previous year. Consequently, earnings per share (EPS) amounted to $0.021 (2017: $0.048), while loss per share for the quarter amounted to $0.004 versus an EPS of $0.011 in 2017. The number of shares used in this calculation was 780,000,000 shares. EFRESH stock price closed the trading period at a price of $1.51 on April 1, 2019. Total Assets grew by 78% or $382.72 million to close at $873.96 million as at December 30, 2018 (2017: $491.24 million). This surge in total assets was largely due to the $120.36 million booked for ‘Deposit on short term deposit’ (2017: nil).‘Cash and Cash Equivalents’ also contributed to this growth by $119.11 million, totaling $184.90 million (2017: $65.79 million). Shareholder’s equity totaled $623.28 million compared to the $243.02 million the prior year. This resulted in a book value of $0.79 (2017: $0.31).